If you listen to the radio you might discover there is a new genre of music being incorporated into many well-known pop songs. Songs such as “Clarity” by Zedd and “Need Your Love” by Calvin Harris featuring Ellie Goulding, show the newest trend in popular music — incorporating electronic elements to songs. Artists such as Lady Gaga have hired electronic dance musicians Zedd and Infected Mushroom to produce her latest album. Pop star Selena Gomez’s next album will heavily feature electronic dance music throughout. The growing popularity of electronic dance music (EDM), as it is most commonly known, can largely be attributed to artists such as Swedish House Mafia, Calvin Harris and Avicii. Artist Calvin Harris has frequently collaborated with R&B singer, Rihanna. His electronic beats have been featured in the hit single, “We Found Love.” Harris, who is one of the hottest artists in music today, earned $46 million dollars last year alone. In fact, Harris had a bigger 12-month take than the likes of Jay Z, and Katy Perry. Last summer, Swedish House Mafia embarked on its “One Last Tour.” The successful house trio parted ways after eight years of producing and touring together. The five-month tour earned the successful house trio close to one hundred million dollars. The last song the group created together was the hit single “Don’t You Worry Child,” which could be heard on a majority of radio stations across the globe. This massive tour brought attention to the otherwise unknown genre that is Electronic Dance Music. Since then, artists such as Zedd, Avicii and Calvin Harris can be heard on many major radio stations across the country. 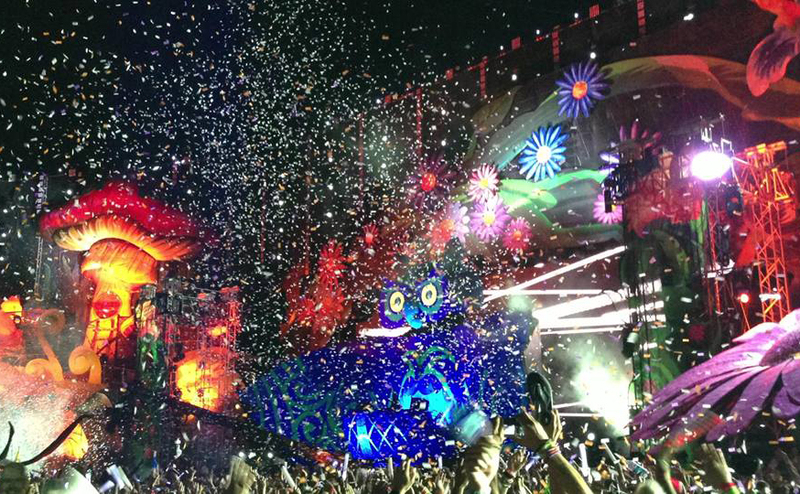 EDM festivals such as the Electric Daisy Carnival have seen their attendance rates nearly triple in the last two years. The three- day music festival held at the Las Vegas Motor Speedway grounds saw crowd numbers estimated at 400,000. The event hosted close to 300 artists performing on six different stages. The main stage featured at the event was longer than two football fields. Each of the six stages featured over the top scenery complete with Circque de solei dancers in elaborate, Technicolor costumes. It was impossible to see every artist on the lineup, my friends and I often had to see half of one performer’s set and then rush to another stage to catch another set. The event was not easy to navigate, especially with such a large crowd. It took me close to 45 minutes just to get out of the crowd during Porter Robinson’s set. I often would get separated from my group but would ultimately find them again after a few minutes. Although the performances were enjoyable, at times it was impossible to move due to the number of people. “I feel like this music is becoming so popular because a lot of people think it’s cool to listen to EDM. I often hear kids say they’re listening to a song by a certain EDM artist, but in fact it’s a completely different artist, it’s become too popular,” said Catherine Ju, who attended this year’s Electric Daisy Carnival. With the popularity growing, particularly in use of electronic beats in popular music, this unique genre will only continue to draw in fans.